Now there is a sports bra for the Game of Thrones fans. This sports bra is black and on it you can see squares and in those squares you find the sigil of one of the houses. And there are a lot of house crest on the bra and yes the Direwolf of house Stark is on there. 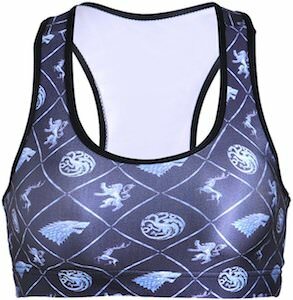 The Game of Thrones sports bra is made 88% polyester and 12% spandex and is available in many women’s sizes. A bra like this is great for a workout but could also be your favorite underwear. Show your love for Game of Thrones by wearing the bra.